We all love typography. I mean - beautiful fonts, beautiful quotes all put together into a beautiful image. It's glorious. I love fonts and quotes, that's no secret. I'm not the best at putting them all together in beautiful images but apparently this week is all about showcasing things I'm not good at so let's get cracking. 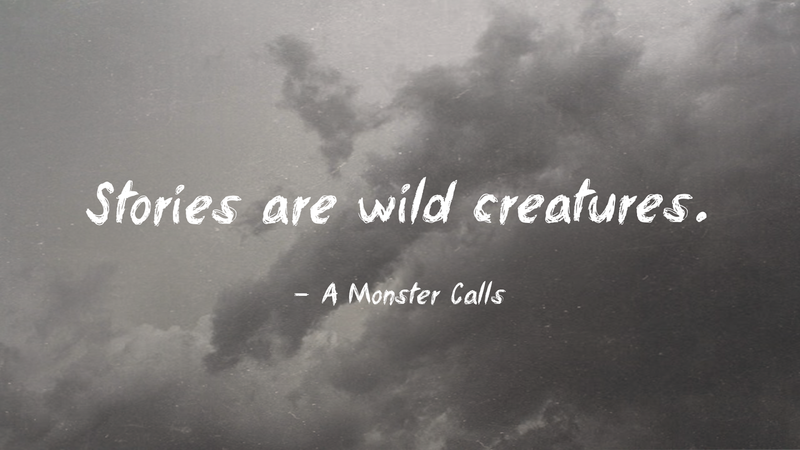 "Stories are wild creatures." - Patrick Ness: A Monster Calls. 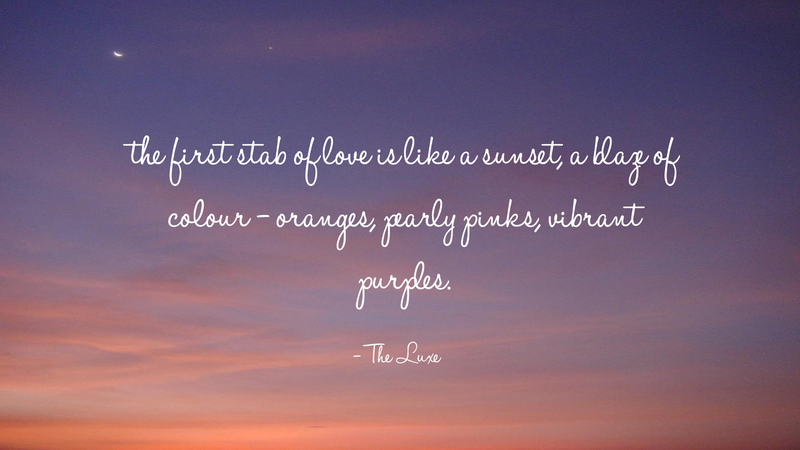 "The first stab of like is like a sunset, a blaze of colour - oranges, pearly pinks, vibrant purples..." - Anna Godberson: The Luxe. "I want to say yes, but I don't want to be with a boy whose heart belongs to somebody else. Just once, I want to be somebody else's first choice." 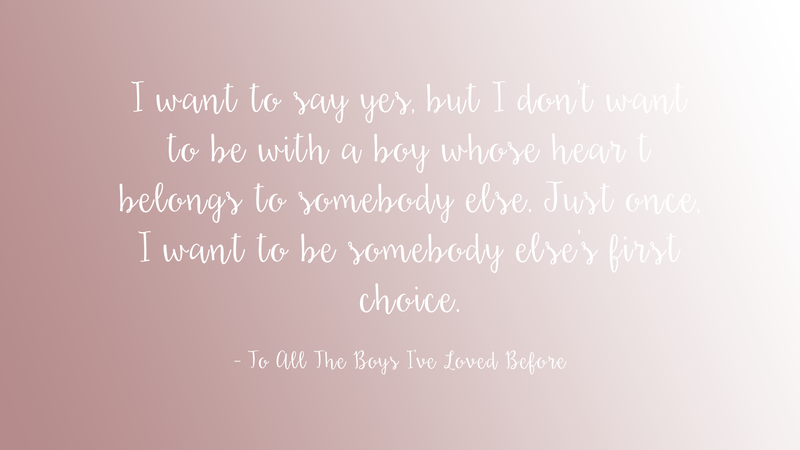 - Jenny Han: To All The Boys I've Loved Before. Ahhh, I love these, Natalie! Ness is an amazing author and I really think I'll love A Monster Calls. That quote just speaks to me. I'm currently really liking More Than This. Thank you! A Monster Calls is the only of Ness' books that I've read. I have More Than This but I'm not going to lie I'm a little intimidated by it. Oh my god. Sana, you absolutely need to read it. It's such a gorgeous, fun read! Esp if you love contemporary romances. It's just really really cute and summery and funny and SO cute. Have I already said cute? Peter K is also BRILLIANT. Oh gosh, these are all so gorgeous! I am absolutely in love with anything to to with quotes and fonts, so this post was practically made for me. I especially like the first one because I think the font and the background picture really fit with the quote you chose! The Luxe has some beautifully written quotes - the storyline grated on me quite a bit though so I don't know when I'll get around to reading the others. Hopefully when I have a bit more courage.